She said she is alive. 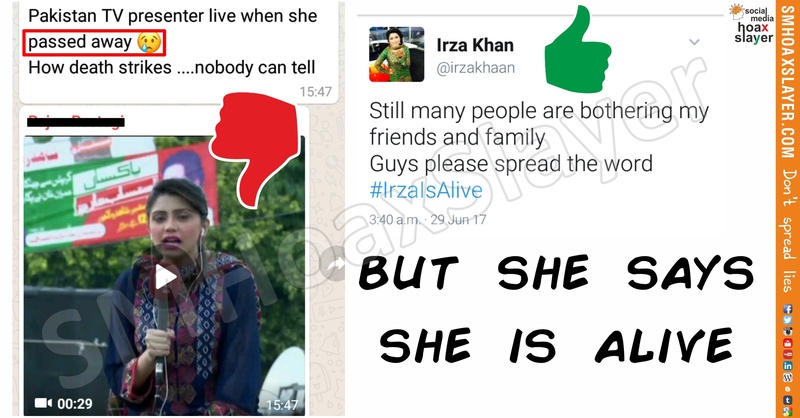 A video is viral on WharsApp claiming Pakistani TV Anchor died on TV which is false. This happened last year i.e. 3rd September 2016, while anchoring Irza Khan fell of a Crane and ended up with bruises, NOT DEATH. ← Is that Kejriwal on the Wall ? He didn’t say it! @DrKumarVishwas only congratulated @yogi_adityanath & hoped for a better UP. A real photo of Achievement or a good looking wrong photo ?